NOW EVERYBODY CAN DIVE - EARLY BIRD SEASON OFFER! Your most recognized Live-aboard Operator in Thailand. Khao Lak Scuba Adventures, is a PADI 5 Star IDC Center that provides you an amazing scuba diving experience on our liveaboard fleet. 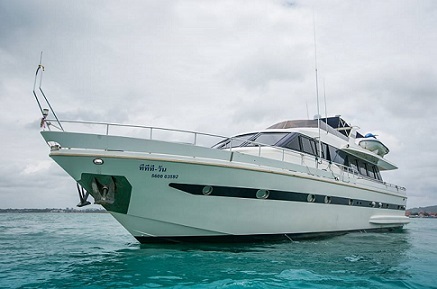 Our Manta Queen Fleet will take you on safaris and day trips to the top destinations in the Andaman sea in Thailand such as, Richelieu Rock, Similan Islands, Koh Bon, Koh Surin and Koh Tachai. All dives are guided dives by highly experience PADI Instructors and PADI Divemasters. All Cabins are comfortable and air conditioned. Join us on-board for your life changing Liveaboard Safari. Manta Queen 1 is cruising a 4 day and 4 night dive safari to the Similan Island National Park, Koh Bon, Koh Tachai, Richelieu Rock and Boon Sung Wreck. Manta Queen 1 accommodates 22 guests in comfortable air conditioned cabins of which three different types are available: Twin bed cabins, Double bed cabins and 4 bed shared cabins to suit groups and families. Mannta Queen 2 is cruising a 3 day and 3 night dive safari to Koh Bon, Koh Tachai, Richelieu Rock and Boon Sung Wreck. Manta Queen 2 accommodates 20 guests in comfortable air conditioned cabins of which three different types are available: Twin bed cabins, Double bed cabins and 4 bed shared cabins to suit groups and families. Manta Queen 3 is cruising a 4 day and 4 night dive safari to the Similan Island National Park, Koh Bon, Koh Tachai, Richelieu Rock and Boon Sung Wreck. Manta Queen 3 accommodates a maximum of 31 guests in comfortable air conditioned cabins of which six different types are available: Twin bed ensuite cabins, Double bed ensuite cabins, Twin bed non ensuite cabins, Master 2 person ensuite cabin, Family Master ensuite 4 person cabin, 3 bed shared cabins and 4 bed shared cabins to suit groups and families. Manta Queen 5 is running a 3 day and 3 night dive safari to the Similan Island National Park, Koh Bon and Boon Sung Wreck. Manta Queen 5 accommodates 20 guests in comfortable air conditioned Twin bed cabins. Manta Queen 6 is cruising a 4 day and 4 night dive safari to the Similan Island National Park, Koh Bon, Koh Tachai, Richelieu Rock and Boon Sung Wreck. Manta Queen 6 accommodates 16 guests in comfortable air conditioned Twin Bed ensuite share cabins. Manta Queen 7 is running a 5 day 5 night dive safari to Similan Island National Park, Koh Bon, Koh Tachai, the Surin Island National Park, Richelieu Rock and Boon Sung Wreck. Manta Queen 7 accommodates 24 guests in comfortable air conditioned Twin bed cabins and 4 Bed share cabins. Manta Queen 8 is running a 4 days & 4 nights trip to Similan Islands, Koh Bon, Koh Tachai, Richelieu Rock and Boon Sung Wreck. Manta Queen 8 accommodates 24 guests in comfortable air conditioned double bed ensuite and twin bed share cabins. You can choose from a variety of PADI dive courses during any cruise with one of our Manta Queen Live-aboards. The PADI Open Water diver course can be done on all our diving boats. The academic and confiened water part of the course will be done in a day or two before trip departure in our training center in Khao Lak so once you are on the boat you can concentrate on pure fun diving. The Advanced Open Water diver course takes 2 Days with 5 dives out of the total amount of dives offered per trip onboard our Manta Queen Fleet with a very affordable budget surcharge and small classes of maximum 5 Students. We offer a large amount of PADI Speciality Dive courses on board our Manta Queen Fleet. The most popular course is the Enriched Air NITROX diver course. The second most demanded PADI Speciality Dive courses on board is the Deep Speciality. Join the tribe to become a PADI Divemaster in a 6 week programme where you will be placed on board our liveaboard vessels, Manta Queens 1 to 7, or as a 6 month internship program. Become a PADI Open Water Scuba Instructor OWSI (IDC) and learn how to teach your passion of scuba diving to the world, continue to become a PADI Master Scuba Diver Trainer or even do your PADI IDCS Staff Instructor Scuba Diving course with us. Dive, eat and sleep. If you come aboard Khao Lak Scuba Adventures’ Similan Island liveaboard, you will not only enjoy all three, but also get to feast on some of the most delicious food on earth: Thai food! But of course, you are here because you’re interested in the diving. And our liveaboard Thailand adventures will not disappoint. When it comes to liveaboard diving, Thailand offers some of the best experiences. You can see plenty of healthy reefs, whale sharks, barracudas, schools of colorful fish, manta rays and more, all while enjoying the stunning island scenery that Thailand is known for. While Thailand is home to some of South East Asia’s most beloved dive sites—such as Koh Tao, Kho Phi Phi, Phuket, Koh Lanta and more—our Similan liveaboard offers something truly special. Similan liveaboards give you the chance to dive in the waters of a National Park 100km off the coast of Phuket. The scenery of granite boulders, caverns, tropical white sand beaches and clear blue waters offer an unforgettable experience. As for the sea life, divers often see guitar rays, blue spotted stingrays, leopard sharks, whitetip sharks, scorpion fish, angel fish and much more. Divers may also spot giant bumphead parrotfish, turtles, mantis shrimps and other sea life, as well as over 500 species of soft and hard coral. As you can see, our Similan Island liveaboard is not to be missed. If you’re looking to join this adventure or another liveaboard Thailand, Khao Lak Scuba Adventures has just what you need.